Accomplished journalists Laura and Greg just finished an important chapter in their never-ending fairytale: their wedding day! Laura and Greg recently tied the knot at the renowned Kimmel Center for the Performing Arts in Center City Philadelphia. Both the ceremony and reception were held within the performance venue’s Hamilton Rooftop Garden. The Hamilton Rooftop Garden is a beautiful atrium oasis that offers incredible views of the Philadelphia skyline. Petals Lane created a wonderful environment with design elements such as the beautiful chuppah, romantic candle lanterns lining the aisle, and stunning floral arrangements at the reception. Photographer Susan Stripling was there to capture all the great moments alongside the talented videographers of Allure Films. After the couple said “I do”, the evening consisted of touching speeches from family members as guests dined on a wonderful culinary treat from the amazing chefs at Garces Events. After dinner, everyone danced to an incredible set performed by the American Deluxe Band, while the beautiful stars shined on them through the Kimmel Center’s soaring glass ceiling. Congratulations Laura and Greg, and may you both live happily ever after! Winter weddings are becoming more and more popular every year. We’re so lucky to live in a city with tons of gorgeous indoor venues to house your wintry celebration, like the Kimmel Center in the heart of Philadelphia! This beautiful performing arts center boasts soaring glass ceilings and unbeatable views of the city, as well as multiple spaces within the venue that can be customized to fit your every need. Situated on the Avenue of the Arts, its location provides perfect access to all of Philadelphia’s best spots for a photo shoot. Just take a look at some of the incredible images that Allure Films captured on Laura and Greg’s wedding day. Laura and Greg’s stunning Kimmel Center wedding was made even more romantic by the chilly weather. It just gave them one more excuse to stay snuggled together the entire day! The day was filled with passionate words, an incredible venue, and a stunning bride and groom who couldn’t stop smiling at each other. Their wedding day was nothing short of spectacular, and we were honored to be a part of such a memorable day. 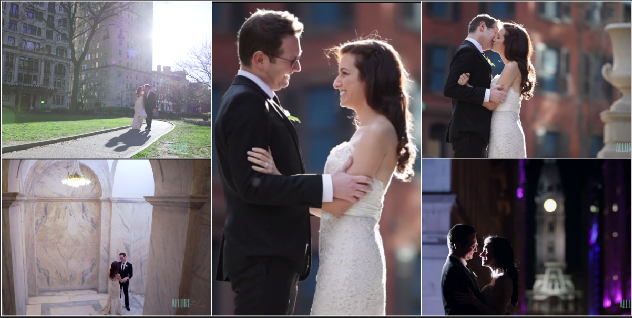 Enjoy a preview of Laura and Greg’s Kimmel Center wedding below! Click to learn more about Allure Films’ wedding videography packages.